Helping to make sure your workplace is clean, safe, and presentable all day every day – no matter what. Surfaces we stand on are the unsung heroes of all New Zealand workplaces. They keep us safe in hazardous areas, comfortable working for long periods of time, and welcome us to work when we need it most. Alsco realises the importance of floorcare – from the health of your employees to the very impression your business makes. That’s why our wide range of floor mats are designed to solve your unique challenges. From vibrant, dust-proof welcome mats through to comfortable anti-fatigue mats, Alsco know how to keep your floors safe and smart-looking. Thought we simply sold you mats? Think again! Alsco does a great deal more than that. Once you make your choice, Alsco will regularly pick up, clean, and replace your mats on a biweekly basis. Buying and cleaning quality mats can be expensive and time-consuming. But with Alsco, you pay a single annual fee, and we take care of absolutely everything. 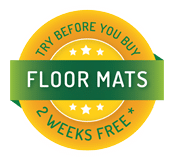 You’ll never be left with worn or dirty mats – and your floors will always be cleaner and safer. Still Unsure? Try Our FREE Trial! No obligations. No hidden costs. Try Alsco’s Managed Floorcare Rental service for 2 weeks – 100% free. Simply contact Alsco using the form to the right to receive your FREE mat! Learn more. Stop dirt at your door and keep your workplace cleaner, safer, and more presentable with zero hassle. Did you know that 70% of dirt and dust is brought in by foot? Did you know that Alsco’s Entrance Mats stop 80% of this dirt and dust – at the door? For years, our mats have been keeping businesses in New Zealand cleaner and safer. Absorbing water, dirt, dust, solvents and more, these are the ideal frontline defence for your business. High-quality, solution dyed nylon and super-gripping nitrile rubber ensure these mats will be with you for years to come. Communicate your brand message in the most effective way by ordering personalised corporate & logo mats from Alsco New Zealand. The most subtle and effective way to do so is to put it on an entrance mat that nobody can avoid. Design branded welcome mats but also create customised staff safety messages. Alsco’s personalised mats make sure you get your message across, regardless of whether it is a safety message or your brand logo. Busy companies are the companies that make the most profit. On the other hand, many people entering your venue means more dirt spreading around your workplace and more wear and tear happens to your floors. Alsco can eliminate these downsides of increased foot-traffic in your workplace by providing you with high-quality, super-absorbent mats. Our beautiful, long-lasting welcome mats are, unsurprisingly, our most popular floorcare product. Every business in New Zealand does its best to keep its employees safe. No matter if it is an office, a kitchen or a workshop, both employer and employees need to take their share of responsibilities for keeping safe. Start from your mat. Subtle but constant reminders about best safety practices are needed. Place the warnings on your Alsco message and safety mats and bring together safety and hygiene. You will find a wet or at least dump place in almost every workplace. Sometimes, you can blame the weather and sometimes, it is the nature of the work. In offices, kitchens, workshops, schools, labs and all other areas, this can be a significant safety hazard. Alsco’s Wet Area mats solve this issue easily. Even if your workplace is dry, prolonged standing can make it unbearable. That’s why Anti-Fatigue mats can save the day. They make the work hours easier for your employees and benefit their health greatly. The areas with high foot traffic are the dirtiest. This means the most people visit them so they have to be the best maintained. Keep them looking clean, sharp and professional by covering them with dust control mats, designed for heavy-duty areas. These types of Alsco mats are perfect for workshops, offices with high-frequency of visitors, especially those that are in areas not entirely paved. In case of rain, these mats are life-savers.